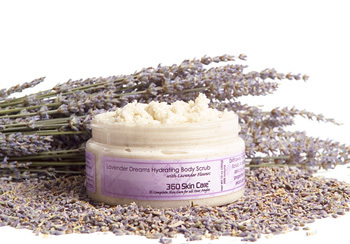 Drift away to dreamland with 360 Skin Care’s Lavender Dreams Hydrating Body Scrub. Massage away the stress of your day while healing and conditioning delicate skin tissues. Sooth parched and weary skin with the therapeutic properties found in Lavender Powder, while scrubbing away dreary skin. Moisturize as you rinse away your worries and reveal healthy skin cells.